All summer I have been planning a trip to Isle Royale National Park, an island in Lake Superior, Michigan. For years, I’ve been wanting to go and hopefully catch a glimpse of the Northern Lights, which can be seen here with great clarity. Actually, I haven’t done much “planning” until recently, just thinking about it and putting it off. Two weeks ago I started planning the trip and by the time I called to make reservations on the ship that takes you to the island, they were booked the day I wanted to leave. Sure, I could have switched my dates around, but then that was going throw off my entire plan. To hike here, there are 3 things that need to fall into place. One, the ship that takes you to the island. Secondly, there’s a ship that circles the island. Unless you plan on hiking a 90+ mile loop, you will need to catch this ship at one end of the island to take you back to the end that you started from, so a different ship can take you back home. The third thing is lodging. I was going to leave from Copper Harbor, a very small town with only a handful of small motels which can easily be booked up this time of year. July 15th – August 15th is the most popular time to visit IR, and for some reason I just kept putting off the planning of this trip and pushed aside my fears that something wasn’t going to be available during my intended dates. Sure enough, my plans to visit Isle Royale have been thwarted yet again, for a third year in a row. Where to now? Well, the place I had my heart set on in May is looking like a prime destination this time of year… Maroon Bells Wilderness in Colorado. When I was planning my hike in May, I really wanted to go here, but there is just too much snow still at that time of the year and I was told that mid June or later is best. I ultimately ended up in the Gila Wilderness of New Mexico as it was one of the highest elevations I could find that was not still snowed in. 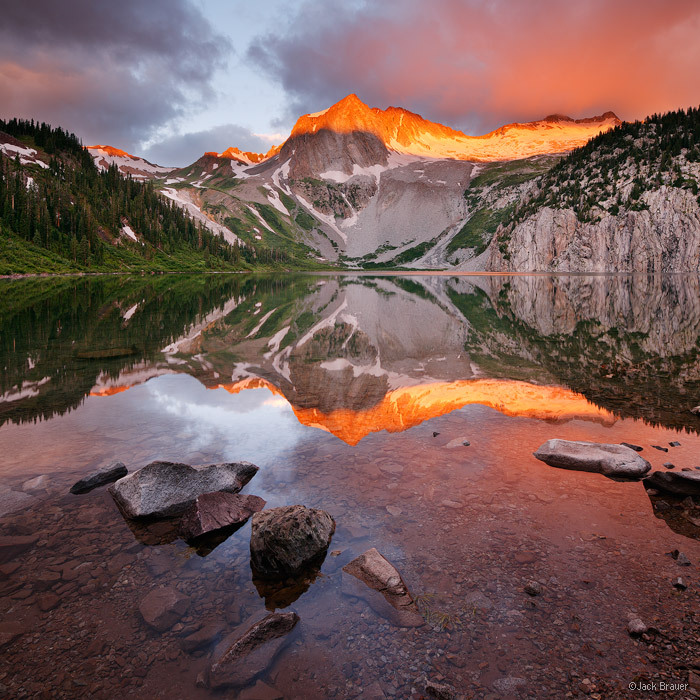 Now, late July/early August is looking like the perfect time to go to Maroon Bells! I have chosen the Four Pass Loop as it has outstanding reviews from those who have hiked it. Here you will find the most photographed mountains in Colorado, the Maroon Bells. The scenery is absolutely stunning from the pictures, which never do any justice once seen in person. Total miles hiked should be around 25-29 miles, not including the summit of Snowmass Mountain. Sure, this trip could be done in 2-3 days, but I am driving 1400+ miles to get here, so why blow past it all in such a short time? I want to hike a few miles a day and have the rest of the day to fish and relax at camp, and play with my new DSLR camera, a Sony Nex-5. Photography beyond “point and shoot” is something new to me, so it’s definitely a learning experience. I bought a bunch of filters for it and have been reading up on outdoor photography, so hopefully I can capture a few good shots. I will be staying in the Denver area the night before at around 5400ft elevation. I live at 600ft elevation, so I hope one night here is enough acclimation time. The trailhead elevation is around 9500 ft elevation, and I plan on hiking to about 10,800ft our first day. I am hoping this is not too elevation gain in one day without being acclimated a night at 7,000ft or more. I know when I was in New Mexico in May (Gila Wilderness), I had absolutely no problems at 10,600ft after camping 2 nights at 6,800ft, but I am bringing my girlfriend on this trip though and I don’t know how she will react to the elevation. Hiking the trail in a clockwise direction will also give us a few days at elevation to acclimate before attempting to summit Snowmass Mountain on day 4. Snowmass Mountain is the 32nd highest peak in Colorado at 14,098ft. It doesn’t sound impressive when referred to as the 32nd highest, but that’s just a testament to the abundance of 14’ers in Colorado, which has 53 peaks over 14,000ft! This will be my first 14er (or 11er, 12er, and 13er for that matter), so needless to say I am excited as hell for this trip. So excited that I am not even missing the idea of Isle Royale anymore! Of course I still want to go, but that will be a trip for another time in the future. I am leaving in about 10 days, so expect a full trip report in a few weeks.